These instructions are intended for the formatting of new hard drives. If you choose to format a drive that already has files on it, you will need to copy your files first to another location – as reformatting completely wipes the drive clean. Film & Digital Media can not be responsible for any lost or deleted files due to failure to follow instructions – please proceed with care. It is strongly recommended that you reformat your new hard drive to the Mac filesystem (HFS+) before using it, even if the drive is labeled being compatible with both Mac and PC (Windows). If you wish to continue working with the drive on your PC after formatting it for the Mac – you can purchase a utility called HFS+ for Windows for your PC which will allow you to read files off your Mac formatted external drive. Be sure to read the note regarding disabling Windows 8 Fast Startup if you are using Windows 8. 1. Plug in the USB cable to the computer and external drive. Plug in the power adapter and turn the drive on. You should see an icon for the drive appear on the desktop. 2. 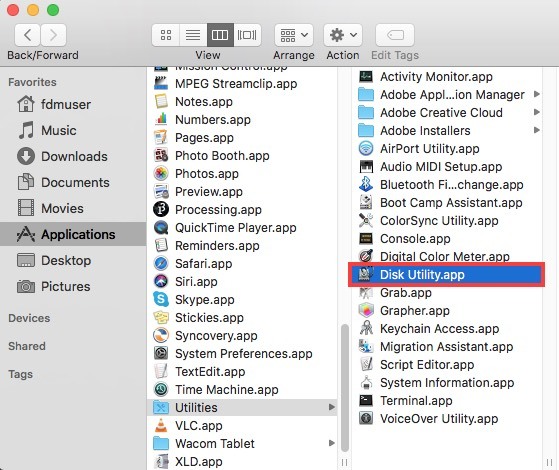 In the “Applications” folder, go to “Utilities > Disk Utility” and double click to start it up. 3a. In Disk Utility, click the button shown below which is located in the top left and make sure “show all devices” is chosen so you can see all the partitions of the hard disks. 3b. In Disk Utility, select the top icon for your external drive in the left column (note in this example it is a Seagate drive). 3c. 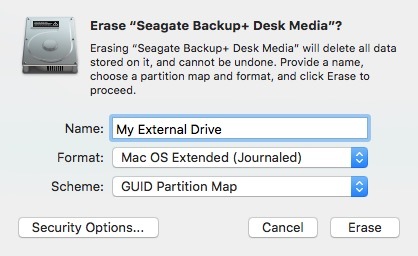 With the top icon of your drive selected, click on the “Erase” button and in the format dropdown select “Mac OS Extended Journaled.” If the drive was formatted to be for both Mac and PC, it will read MS-DOS and or FAT32 before you reset this. 3d. Click on the “Erase” button. The interface will grey out some areas, but then will reset to dark once reformatting is complete. It only takes a few second for the drive to reformat. 4. 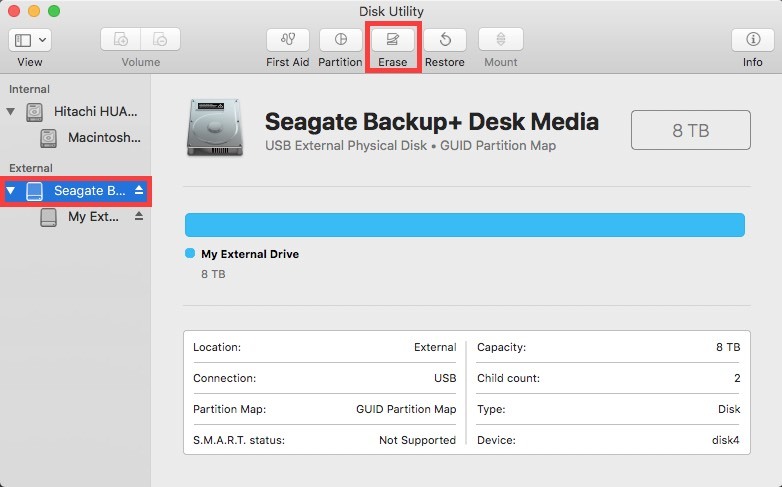 Quit out of disk utility – you’re ready to use your Mac format external hard drive.